Add records from any Salesforce object to Campaign Monitor via a list view or report. Map Salesforce fields to Campaign Monitor custom fields to allow segmentation or personalization. The import wizard needs a source in the form of a Salesforce report, list view or SOQL statement. If you have not already done so create a Salesforce report or list view ensuring you include an email field. If you are using SOQL you can straight to the steps below. Select the subscriber list you want to work with by going to the subscriber list tab. Then click the label of the list e.g. SL-0001. Now click Import Wizard then click the New Import button. The wizard will appear asking you to select between a Salesforce report, list view or SOQL statement. Next map Salesforce fields to Campaign Monitor custom fields. If you already have custom fields in Campaign Monitor, these will appear. If not you can create them from this screen. If you choose to map a Salesforce Contact or Lead Id we will use this to match records instead of an email address. The wizard allows you to immediately start the import, set up a schedule for future runs or both. If you choose to schedule you can select one, more or all run times. On the same screen there is an Advanced Settings, learn more in the tip below. 1. You can choose (default) to only add new records or replace will delete any subscriber who are active on a list and are not contained within your report, list of SOQL statement. 2.Clear bank values allows you to clear values in a Campaign Monitor field in the corresponding mapped field in Salesforce is also blank. Once submitted a subscriber import record will be created and visible on the import wizard section. Here you will be able to monitor the status of the import, see scheduling information, and view the results of a completed import. Every time an import runs it will add any new subscribers and update custom field mappings. Click on the dropdown and click edit. You can then navigate through the import allowing you to make changes. Click on the dropdown and click delete. A Salesforce record is linked to Campaign Monitor, by default, via an email address. In Salesforce we use the standard email address field. You can override this behaviour by sending the Salesforce record Id to Campaign Monitor (as a custom field). If there are duplicate emails in Salesforce, we will first attempt to match on the value found in the Campaign Monitor custom field named Salesforce Id. If no match is found or the Id is empty, then the match will be made on the most recently updated Salesforce record. To link the records via the import wizard, simply map the Salesforce Contact or Lead Id to the Salesforce Id field. This automatically creates the custom field in Campaign Monitor and updates it with the Salesforce Contact or Lead Id. Click on the dropdown and select results. I want to add both Contacts and Leads to the same subscriber list using the import wizard. Start by creating a report or list view for your contacts and then repeat for your lead records. Then follow the instructions above for creating an import start with contacts and then repeat for leads. 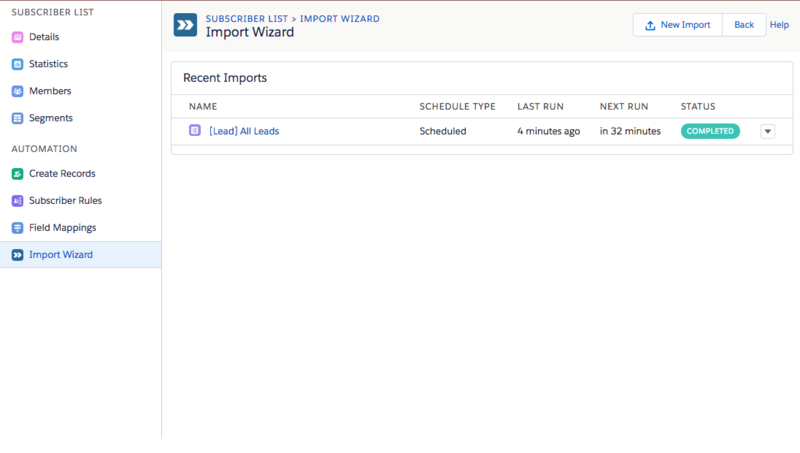 You can create multiple imports, using the wizard, for the same subscriber list. I have two email address fields on my contact records, and I need to add both to the same subscriber list. The process is the same as the scenario above. However, this time instead of creating a report (or list view) for two different objects (contacts and leads) you will instead create two contact reports. The first report will include the Salesforce Contact ID and one of the email addresses. The second report will also include the Salesforce Contact ID and the other email address. With the reports (or list view) in place, you can create two separate import using the wizard. Please ensure you map the Contact ID to the Salesforce ID. Mapping the ID will ensure the subscriber list membership record is created against the correct Contact in Salesforce.